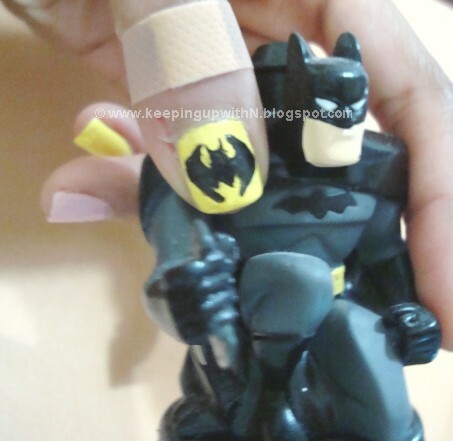 Batman is my favorite super hero. I love everything Batman. 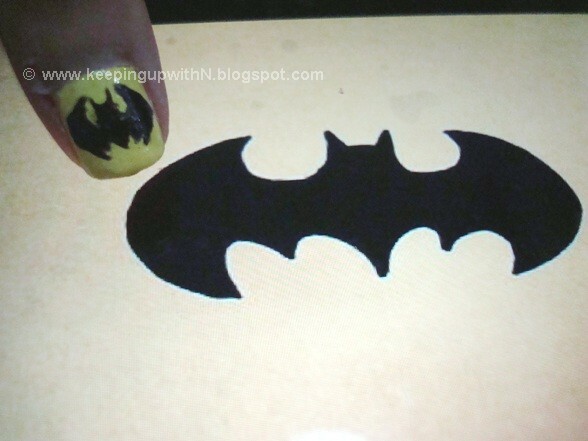 So when the last installment from Chris Nolan was due to release, I spotted so many girls paying homage to the caped crusader through different nail art. It may look difficult, but it isn't! So here's my nail. It took me 3 tries to get the logo almost right (I was also getting a bit (okay a LOT) frustrated since one side of the wing would be broader or the ear wouldn't appear right but it was Batman, so I just counted to 10 and started over. Read: I have very little patience). I used Sally Hansen's nail polish in Yellow Mellow and for the black, I actually used my eyeliner. I found the eyeliner as opposed to black nail polish much easier to handle when it came to this drawing. If I made a mistake, I just dabbed a cotton swab in make up remover and wiped the area of the logo that didn't look right. Once dry, I sealed it with a top coat. If you don't know how to create the Bat logo- it's quite simple. Just follow the instructions here.